When Maryanne of Mama Smiles blog shared her vision (& very personal reason) for the Small Hands Creating Hope project, I knew I had to be part of it. I LOVE that it is a celebration of life, gives us an opportunity to talk to our children about people who are affected by cancer and offers the chance to do something on their level for others. What exactly is Small Hands Creating Hope? A wonderful and diverse group of bloggers have come together to put together a book of crafts made by little hands with the intention of bringing HOPE to cancer patients and raising money for cancer research via The American Cancer Society. The book is filled with many lovely projects but today I will share our contribution with you. 2. After it dried, we added pom poms to make the body. 3. WFold in half and cut out symmetrical some shapes. 4. Add colored tissue paper to cover the holes. 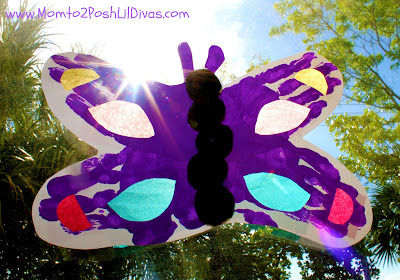 Easy Peasy Handprint Butterfly Suncatcher! 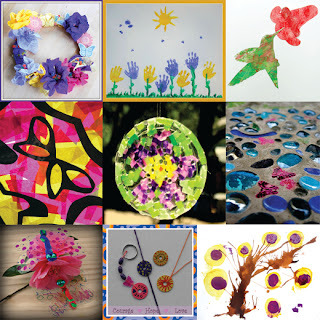 Want a peek at a few more of the projects featured in the book? Once you make a $15.00 donation you will receive the download for the ebook (you can also purchase a hard copy at cost). If you do not receive a link or have any trouble at all please contact smallhandsproject at gmail dot com. To donate just click the button below. A heartfelt thank you to all the participating bloggers. Together we are working to raise money for a good cause. Won't you help us? I love that your butterfly is made from your girls' handprints AND that it doubles as a suncatcher! Thank you so much for being part of this project!!! What a wonderful butterfly! It would brighten up any window.